Main Menu > Pharmacy Medicines > Alli > Weight Loss > Detox and Cleanse > Peppermint > A. Vogel > A. Vogel Echinacea > Immune Support > Echinacea > HealthAid Vitamins, Minerals And Supplements > Health Aid Vitamin D3 1000iu 120 Tablets. 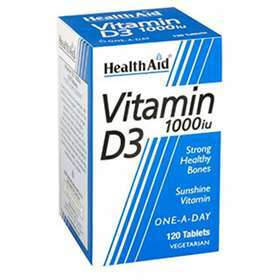 A food supplement containing Vitamin D3 which is a fat soluble vitamin which is essential for the immune system and the maintanance of normal muscle function. It also has a huge impact in the development of strong healthy bones and teeth. Development of bones and teeth. Adults and children over 12 years of age - One tablet daily. Bulking agent (maltodextrin, microcrystalline cellulose), Vitamin D3 (cholecalciferol), Anti-caking agent(silicon dioxide, veg. stearic acid, veg. magnesium stearate).